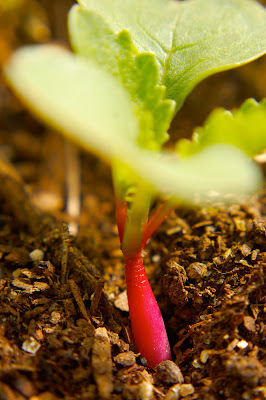 Radishes are supposedly the lickety-split vegetable, the seed you poke into the ground when you want to impress a child with the whole cycle -- seed to seedling to munch-munch. But the child in me and the children around me too are impatient for even the hastiest radish. We tend to eat radishes tiny and bead-like, at least early in gardening season. This spring we are enjoying them two ways. The first is roasted. One rainy day, we were preparing a meal that was almost entirely from our garden: overwintered-leek-and-should-be-seed-potato soup sprinkled with watercress. We needed a little nibble to hold us, and we just happened to have harvested a handful of the most beautiful Cherry Belle radishes. So we lit a fire under a cast-iron skillet and whirled some olive oil around until it got hot. We sizzled the radishes (leaves and all) in the hot oil, then popped the entire skillet into a 400-degree oven. We roasted them for about eight minutes, topped them with a squeeze of lemon, a pat of butter, and a grind of pepper, then sea salt. They were small as gumballs and still chewy and zingy in the middle. But the leaves -- oh, the leaves! -- were snappy and crackly. They were gone lickety-split! Our other favorite radish preparation is either a French breakfast or a Midwestern farmer's lunch. We could happily eat it every meal of the day. We use French Breakfast radishes (again, on the small side), and we slice them into translucent little rounds. We butter some of Birch's daily bread, layer on the radish slices, then sprinkle with a lot, a lot, a lot of Malden's flaky sea salt. It is a feast on a hot day (such as today when the thermometer has hit 88 degrees, which is not cool by me -- in Maine, in May?). The radishes and salt look icy, but their crispness has a spicy-sour verve that gets gentled down by the sweet butter. Who wouldn't be impatient for the radishes to grow when the eating is so delicious? One minute, it's just Monday. Granted, it is better than most Mondays. It is full-blown spring. And Baby G is here to play. Then it becomes one of the best days of all, a day we dream about and plan year-round. Our chicks arrive. This year, they are six Rhode Island Reds. Monday is a great day for falling in love. Spring has released us out into the sunshine. It's the season for supper on the back porch. And since we're lazy sorts, we've planted good nibbles right here. What wonderful synchronicity that the most delicious greens sprout early and come on strong in the cool weather, just when we are happiest to soak in the sunlight that pools near our back door as day goes down. The garden planter closest to the kitchen almost made it through the winter with buoyant mache and arugula and spinach. Those greens all but glowed in contrast to the snow and the dead-stick honeysuckle toughing it out nearby. But then a two-below wind ripped the greenhouse plastic off one night and...whoosh! Just like that, everything was freeze-dried. Lucky for us, the spinach merely hunkered down for spring, and the mache too came back as soon as the weather warmed. I had underplanted everything with more mache and arugula seeds. Those germinated in February. By March, I was able to plant more seeds in the empty planters I had prepped in the fall with fresh compost. They are now providing us with lettuces like Tom Thumb and Lollo Rosso and Forellenschluss, as well as Wrinkled Crinkled Curly Cress. Radishes are plumping up. (Why is it that radishes are supposedly the fastest vegetable, but when you're waiting for them, it takes a lot of waiting?) The Melting Mammoth peas are twining up the twig supports. From out here on the porch, we have a view of the chickens pecking in the shiny new grass and the leaves unfolding on the trees. The birds sing, and we grow still, listening for the cardinals, the swallows, the orioles. Ducks fly over on the way to the river. When the pizza oven is burning, we can watch the fire. Most of all, we can see up close the miraculous stirrings among the plants: Peas reach for a place to grow. Lettuce bundles up into tight mounds. A garlic chive seed sprouts a little thread that does a kind of yoga on its way to straightening up. Here's what I savor most as my children tend the seedlings and sniff the cilantro and sneak a curly cress leaf (or three), I savor knowing that it's all right here in the middle of our lives: growing our food, preparing it, sharing it with one another. It's the slowest food imaginable, and it slows us down to enjoy life. It's so local it's intimate. Like our back-porch garden planters, our food is right here in the center of our lives. If you were a girl (or two) who really really really wanted a goat (or two), you would start a little business selling eggs. You would go out twice a day -- rain, snow, or shine -- and you would pamper your hens because happy hens lay lots of eggs. You would call your business Daisy Family Eggs, and you would make little labels for the egg cartons. 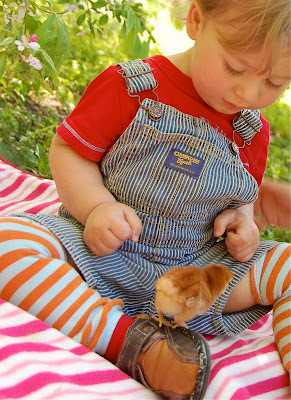 You would ask all your friends if they wanted to donate to your cause in exchange for farm-fresh eggs from happy hens. You would faithfully collect the eggs from the nesting boxes and wash them -- even when they were extremely poop-covered. When you squabbled with your sister about who had to wash the most poop-covered eggs, you would sit down and write out an egg-washing policy that involved flipping a coin to see who got to choose the first four eggs, then alternating every four eggs after that and keeping track from day to day. Happy hens must have happy keepers. You would track how many eggs went out and how much money came in using a ledger designed especially for you by your grandfather. You would open all Valentine cards with one eager thought: How much can I add to the goat fund? When you were doing your history lesson, you would hear about the Virginia Company and that would make you ask questions about stocks, and you would find out about something called the stock market. You would insist upon trying the stock market out for yourself and would invest birthday money from last year. You would do research and choose your own penny stocks based on things you like (Google and Apple computers), and you would watch your stocks tick up and down and up and down. You would cheer when it was up. You would pout when it was down. You would count your money often. You would balance your ledger carefully. You would check out the Nigerian dwarf goat farms online that were showing off their newborn goats. You would ask your mama, Is this farm close to us? Is this one? You would get your daddy to stop by one of the farms. You would meet two baby does there. You would fall in love. The next day, you would go back with a one-hundred-dollar bill as a deposit for those twin baby goats. You would name them Buttercup and Clover. You would hold them and smile and wish you could take them home right that minute. You would. And you did. In June, Buttercup and Clover will be coming home to live with two girls who really really really wanted a goat (or two).